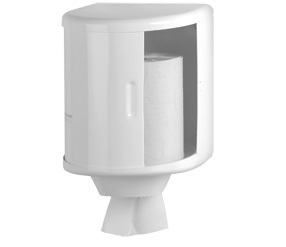 Mediclinics paper towel dispensers are designed to be installed in any type of public washroom and offer solutions in different paper pattens designs and sizes. Models for a more efficient use of the paper and suitable for different washroom environments: gymnasiums, sports centres, hospitals and health centres, hotels and similar type installations; solutions even for use in different places. Models suitable for C/Z folded paper towels; in this category, products are available that allow amounts ranging between 200 and 1000 towels. The rest of the models operate with paper rolls, which depending on the item, have a roll size ranging from 145 mm to 250 mm in diameter. Paper towel dispensers made using different materials and finishes; specifically: White epoxy steel, bright or satin stainless steel AISI 304. All Mediclinics paper tower dispensers are supplied with a lock and special key for opening and screws. These dispensers are especially designed so that the paper can be easily replaced. Also, most models of this brand include anti-vandalism features and incorporate mechanisms to facilitate and optimize the use of paper like for example the dosing brake, which ensures that single paper units are dispensed or the metal serrated lip to facilitate cutting the paper in models that use paper rolls.